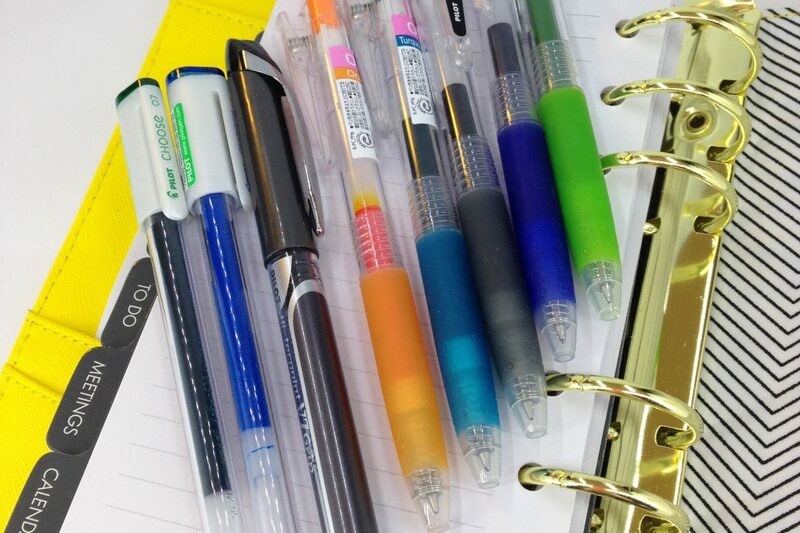 The quest for the best planning pens… Pen peace? I think I’ve known for quite some time now that I’m a pen addict. I just can’t help it. If I see a nice pen that I haven’t tried before I have to grab it. I tell myself that I’ll review it for the blog and that can justify the purchase except I never actually get round to doing it. Until today. I collected together some of my most recent purchases to give you a heads up of what to run out and buy and what to avoid if you see it for a steal in your local shop. I’m beginning to really love Pentel’s. I’ve raved about the Energel pens before and this new one is just as lovely to write with. The same goes for the Gold Pentel pen. although you can just see that it had gone a little scratchy on the first P but generally it’s lovely to write with. The Papermate Replay is a little thicker than other 0.7mm pens and like most erasable pens I’ve come across, the depth of colour isn’t all that great. I wouldn’t buy these again. Sadly the same goes for the Uniball. It’s a 0.7mm like all my others but you can see it’s thinner and scratchy in places. It’s not that nice to write with and will get relegated to going into work one day. I’m really not sure about the Hi-tecpoint. Some days I really don’t like it, others I think I should just use nothing but this. The main thing I find with this pen is because it has quite a point to it and it’s a liquid ink I find myself writing quite small (but actually quite nicely with it). Given I use a personal Filofax this should be good for me to use in it and I may try that next week as an experiment. I’m normally a gel pen girl through and through but this… may make me change my mind. The Choose and Juice swatches really highlight (to me) that you can love a pen in one colour and it can feel like a completely different pen in another. The Choose in blue is really nice and smooth to write with, but in green I don’t like it. The same goes with the Juice pens. I had the Orange one for ages and used it for everything but in some of the new colours it just doesn’t write as nicely (green again and the blue black). I’ve never found such variance between colours with other pen brands. The Pentel Slicci’s for instance are exactly the same, no matter what colour you’re using them in. I struggle writing neatly so a good pen is really important to me. I love Pilot pens and used to consider them my favourite pen brand but the more I use them, the more I have doubts. Pentel pens on the other hand consistently impress me and the next time I want a load of new pens I’m leaning towards buying every Energel colour in existence. If you have a favourite pen, let me know in the comments below!